So a big reason for wanting to make this trip was to go picking pulping of my own coffee. I’ve never been able to say I have picked the coffee I roast as pickings have been on farms that we have been unable to buy everything from. But as we do this with Machacarmarca it seemed like a great chance to work with the coffee I’ll be working with over the next 9 to 12 months. I also have never been able to process and pulp before and seeing how a farm does this can give you a big insight into why the coffee tastes the way it does. I was to find out this was probably the highlight of the tour for me as I never understood why machacarmarca tasted the way that it did, I think I do a lot more now. So early breakfast and of to pick with my basket. I thought maybe three four in a day I’d need to empty the basket. I didn’t plan for how hard it is to pick coffee. The guys told me they do this four five six times a year not just triple picking which is thought to be good but making sure only ripe cherry’s are picked not doing any post sorting as a lot of other picking is. the yield is so small ere that if they did this we would have virtually no coffee. 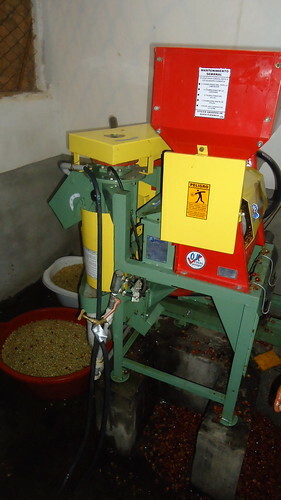 Picking takes three four months because of this method, but it makes sure you get the very best cup. The guys told me I had done well and they were impressed, I am not sure if this was due to their low expectations of me, or they were truly impressed. I was slower than them of course but I wasn’t a million miles behind as I had thought I might, so I was pleased with my mornings work. Great food was the foundation of this trip. Great home cooked food, well prepared great portions at the right times. Home backed bread from the huge clay oven. But the best part was everyone stopped (including the pickers) and got fed. The other part was it was all about sitting together and family. I was accepted within 20 mins of being on the farm as family, we all talked and shared what we had done. I was tempted with beer and siestas or world cup football games at the local bar, but I had a job to do so back to picking I went. The day I picked around 20-25kg, and was told this was not bad, the guys were around 35-40 kg. This kind of selective picking is hard work, low yielding and very hard work mentally and physically. But I think we have all seen in the cup what this kind of extra work does to the cup. While picking the cover of the trees meant even in the midday sun it was cool and a nice place to work. It made me think about shade and its importance in the final product. I was given a number but in translation it got lost what it was referring too but it was most plots the size with these varietals, with this we were working on would yield 12 – 18 (of what ever it was) this plot yielded 9 at its very very best, and this was replicated across the farm. But Mario and Lupe have no desire to increase that yield, but to maintain the quality. 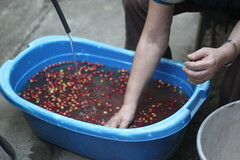 Then it was time to pulp, this washed fermented to remove mucilage coffee. Everything at this stage is done with Lupe’s input, she is the hard work of the farm, and the consistent. Everything is had weighed and then hand floated, in small plastic containers. There are no huge tanks to do this in just plastic baths. A rudimentary but incredibly effective way of doing it. Small batches (everything is picked and de pulped within 20 mins of finishing picking) by hand and eye. Because of the skill of the pickers there were not many floaters but what there were are removed and used for consumption on the farm or in the community. This is where the true pleasant surprise came for me. I have always been told this was a washed coffee and although it presented with some washed qualities I have never 100% felt it was a washed and fermented coffee. Three days on the farm I had not found a fermenting tank so when the pulping began I waited with excitement. 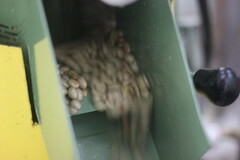 The beans are run through the depulper and the cherry is removed with a small amount of water and the centrifuge force of the depulper. Some small pieces of cherry run through get through, but on the whole most make it through in the correct condition. If you touch these beans they are slimy and sticky from the mucilage. Normally on a traditional washed coffee these would be put into to water to ferment to remove this sticky slime. But these are run through the bypass system to be washed once more, which visibly removes some of the mucilage, but not all. It is then taken to the Indian drying tables on the back patio to dry in the sun, being turned regularly and taken to a moisture level of around 13%. They are then bagged and taken to the plant in La Paz (more of that to follow on that part). This day was the real highlight for me, an awakening of what the coffee is, and an insight into how dam hard it is to pick coffee well. I slept like a log this night in bed by 8:30 pm in a heap. Before bed Mario and Rodrigo took me through a presentation of the plans for the coming years of the farm, of improving quality ecology and increasing production with new plant stock. also maintaining the current stock by pruning and maintenance. A great piece of news was also that the farm is in stage two of organic certification. The farm has always been organic so they thought they should take advantage of it. so next years production will be organic certified which is no bad thing. Amazing. What a great story – the family, the tradition, the ecology. 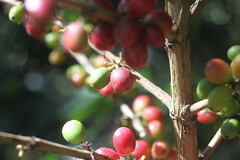 Great to see the care and attention given to the farming of this great coffee. Reading your blog makes me want to go on such an origin trip myself! Looking forward to the subsequent parts. Loved the story and I can’t wait for the last part!! Did you eat a lot of coffee cherries while picking? What does it do to you? I wonder if there is anything one could do with the pulp? A coffee-pulp pudding could be something amazing!!! 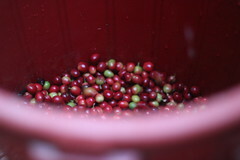 I remember thinking that the few cherries I tasted in Costa Rica did not have a very strong taste, but I took a few semi-pulped beans home and dried them. They are now on my desk and if I put them in my mouth they still have a wonderful sweetness a bit like these fructose-sweets we got as kids…. I am SO jealous of your coffee picking excursion, I am craving to do this myself some day!